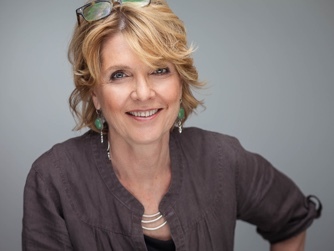 Gini Reticker, director of The Trials of Spring, is an Academy Award-nominated and Emmy Award-winning filmmaker, an executive producer of Women, War and Peace II, and a producer of Wave Goodbye to Dinosaurs. 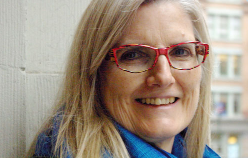 Throughout her career, Reticker has been a passionate advocate for women’s rights with a focus on enabling the worlds’ unsung heroines to tell their stories. She has created numerous films, directing the acclaimed Pray the Devil Back to Hell, the Emmy-winning Ladies First, and producing the Oscar-nominated Asylum. Reticker co-founded Fork Films, serving as executive producer on numerous projects including The Armor of Light, Cameraperson, and Hot Girls Wanted. 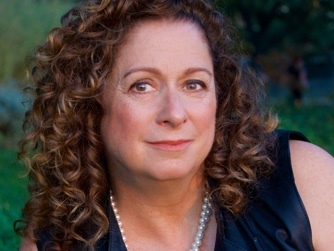 Abigail E. Disney is a filmmaker, philanthropist, activist, and the Emmy-winning director of The Armor of Light. As president and CEO of the documentary production company Fork Films, she produced the groundbreaking Pray the Devil Back to Hell and co-created the subsequent PBS series Women, War & Peace. She is also the Chair and Co-Founder of Level Forward, a new breed storytelling company focused on systemic change through creative excellence. The companies and stories that have most meaning for Abigail are the ones which foster human understanding. She has executive produced and supported over 100 projects through Fork Films’ funding program and created the nonprofit Peace is Loud, which uses storytelling to advance social movements, focusing on women’s rights and gender justice. Kirsten Johnson, who works both as a cinematographer and director, recently shot the Sundance 2012 Audience Award winner, THE INVISIBLE WAR. In 2011, she was the supervising DP on Abby Disney and Gini Reticker's series, WOMEN, WAR AND PEACE, traveling to Colombia, Bosnia, and Afghanistan. She shared the 2010 Sundance Documentary Competition Cinematography Award with Laura Poitras for THE OATH. Her cinematography is featured in FARENHEIT 9/11, Academy Award-nominated ASLYUM, Emmy-winning LADIES FIRST, and Sundance premiere documentaries, FINDING NORTH (now titled "A Place at the Table"), THIS FILM IS NOT YET RATED, AMERICAN STANDOFF, and DERRIDA. A chapter on her work as a cinematographer is featured in the book, "The Art of the Documentary”. She is currently editing a documentary on sight that she shot and directed in Afghanistan. Her previous documentary as a director, DEADLINE (co-directed with Katy Chevigny), premiered at Sundance in 2004, was broadcast on primetime NBC, and won the Thurgood Marshall Award. Johanna Hamilton most recently directed and produced 1971, about the break-in of a small FBI office in Media, Pennsylvania by a group calling itself the Citizens’ Commission to Investigate the FBI. The break-in revealed the existence of COINTELPRO, a huge secret, illegal, domestic surveillance program. It premiered at the Tribeca Film Festival in 2014. It won the IDA’s ABC News VideoSource award and Cinema Eye’s Spotlight Award and was broadcast on Independent Lens in May 2015. Prior to that she co-produced PRAY THE DEVIL BACK TO HELL the gripping account of a group of brave and visionary women who demanded peace for Liberia, a nation torn to shreds by a decades old civil war. It premiered at the 2008 Tribeca Film Festival where it won Best Documentary and was short-listed for an Academy Award. She has produced non-fiction programs for, amongst others, PBS, The History Channel, and The Washington Post/Newsweek Productions. 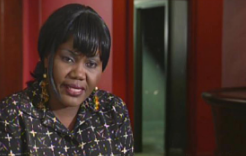 She began her career in the run-up to South Africa’s first all-race elections working on the country’s premier investigative news magazine program, "Carte Blanche". 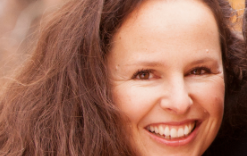 An artist, amateur pianist, documentary film director and editor, Kate Taverna has edited about 50 independent and broadcast films for PBS Great Performances, American Masters, Wide Angle, Court TV, A&E, ARTE France and Germany, and BBC Bookmark. SHE'S BEAUTIFUL WHEN SHE'S ANGRY won the Audience Award at the 2014 Boston Independent Film Festival. ASYLUM (2004) and KILLING IN THE NAME (2011) were nominated for Academy Awards in the Best short Documentary category. PRAY THE DEVIL BACK TO HELL won Best Documentary award at the 2008 Tribeca Film Festival. Her edited documentaries for Bill Moyers’ series and the Egg Show on PBS have received Emmy awards. Taverna has also co-directed, co-produced and edited the 2012 feature length In Bed with Ulysses, as well as the 1989 Lodz Ghetto, an award winning feature documentary which screened at international festivals, was theatrically released nationally, aired on PBS and continues to be broadcast internationally. 2011 Nobel Peace Laureate Leymah Gbowee (pronounced LAY–mah, BEAU-wee) is a Liberian peace activist, trained social worker and women’s rights advocate. She is Founder and current President of the Gbowee Peace Foundation Africa. She also founded the Liberia Reconciliation Initiative and Co-Founder and former Executive Director of Women Peace and Security Network Africa (WIPSEN-A). She is also a founding member and former Liberia Coordinator of Women in Peacebuilding Network/West Africa Network for Peacebuilding (WIPNET/WANEP). Leymah currently serves as a member of the High-Level Task Force for the International Conference on Population and Development. She is a board member of the Federation of Liberian Youth. Leymah’s leadership of the Women of Liberia Mass Action for Peace – which brought together Christian and Muslim women in a nonviolent movement that played a pivotal role in ending Liberia’s civil war in 2003 – is chronicled in her memoir, Mighty Be Our Powers, and in the documentary, Pray the Devil Back to Hell. 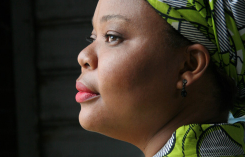 In addition, Gbowee is the Newsweek Daily Beast's Africa columnist. She serves on the Board of Directors of the Gbowee Peace Foundation and the PeaceJam Foundation, and she is a member of the African Women Leaders Network for Reproductive Health and Family Planning. Leymah has been an Oxfam Global Ambassador since 2013. She is also a member of the International Honorary Committee of the Global Biosphere Institute and the Aurora Prize Selection Committee. She holds a M.A. 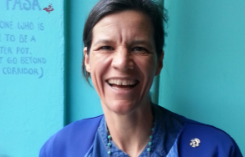 in Conflict Transformation from Eastern Mennonite University (Harrisonburg, VA), and a Doctor of Laws (LLD) honoris causa from Rhodes University in South Africa and University of Alberta in Canada. Leymah was honored as a flag-bearer for the opening ceremony of the 2012 Olympic Games in London. After receiving the Barnard College Medal of Distinction, she was named as a Distinguished Fellow in Social Justice and a Visiting Transnational Fellow at the Center for Research on Women, and Fellow in Residence at the Athena Center for Leadership Studies at Barnard College for the 2013/2014 academic year. Leymah was on August 20,2016 awarded the Lifetime Africa Achievement Price(LAAP) for Peace in Africa by the Millennium Excellence Foundation. She is currently Executive Director of the Women, Peace and Security Program at Columbia University, a Distinguished Scholar-Activist Fellow at the Union Theological Seminary, a Member of the United Nations Sustainable Development Goals (SDG) Advocacy Group and a proud mother of eight children. 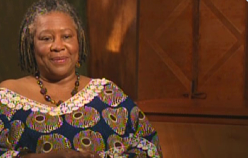 Etweda “Sugars” Cooper is one of the doyennes of the Liberian women’s movement and is known for speaking out. 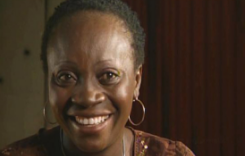 In 1994, during one of the darkest hours of the civil war in Liberia, she and other women -- tired of being victimized and frustrated at the stalemate in the peace process -- founded the Liberia Women Initiative to advocate for disarmament and free and fair elections, and also to bring pressure to bear on stakeholders for the inclusion of women in negotiating a settlement of the Liberian conflict. Throughout 14 years of civil war she used mass action including picketing, sit-ins and marches involving grassroots and professional women and their groups to attract world attention to the plight of women and children and to urge the international community to take action to end the war. As a strategist for the Liberian Women peace activities under the auspices of Women In Peace building Network, WIPNET, Sugars was unrelenting in lobbying factional leaders through visits, dialoguing and pleading with them to resolve the stalemate in the Accra Peace Talks in 2003, urging them to agree to a ceasefire and to constitute a transitional government. Asatu Bah Kenneth was a police officer for 25 years—since before the war began. As the president of the Liberia Female Law Enforcement Association, Asatu was invited to the first meeting of WIPNET and then to the launch of the Christian Women's Initiative. She was so moved by what she heard that she stood up and pledged to mobilize the Muslim women of Liberia to help bring peace to Liberia. And she did, creating the Liberian Muslim Women’s Organization. Liberian Mass Action for Peace came into being when the two organizations joined. It was the first time Christian and Muslim women had worked together in Liberia. Asatu’s position in the police service gave her access to intelligence about the war. On one occasion, as the war was closing in on Monrovia, Asatu called a meeting with Leymah, Sugars and Janet and other key members of WIPNET. After that meeting the women issued the all-important position statement that they would eventually take to their meeting with Charles Taylor urging him to sit down at the peace table with the rebels. Her nickname is the “stabilizer” because she doesn’t take sides. 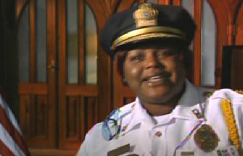 After the war she became Liberia's Deputy Chief of Police and focused on bringing more women into the security sector. Recently she was appointed the Assistant Minister of Justice for Administration and Public Safety. She is proud to be part of the international peace-building community. 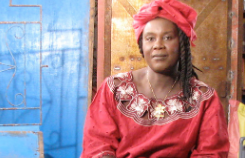 Etty Weah was one of the hundreds of ordinary women who became involved with WIPNET and the Liberian Mass Action for Peace. She was one of the many women who wore white and sat on the field day in and day out. Rain or shine. Bullets or no bullets. Before the war, she used to sell food in front of her house in one of the suburbs of Monrovia. As a regular church goer she responded to a call from the Christian Women's Initiative to become involved in Liberian Mass Action for Peace, and got to know Leymah. She was moved to attend the meeting because she deemed all Liberian women to be victims and thought there was strength in numbers if their voices were to ever be heard. As the war drew closer to Monrovia, and as the mother of two boys, she also feared for all the children who would be conscripted. Janet Johnson Bryant was a journalist. Much of the time she worked for the Catholic radio station, Radio Veritas in Monrovia. Her beat was the Executive Mansion, occupied by Charles Taylor, who had a virtual stranglehold over the media. Journalists were often openly bribed during press conferences. She also hosted a radio show about women’s issues. Bryant’s efforts to expose corruption during Taylor’s regime earned her the nickname "Iron Lady of Media." Janet met the women of WIPNET when she reported on them for a story. She soon became part of their outreach and advocacy program. Like Asatu, she used her position to garner important, strategic information that benefited WIPNET. In particular, Janet helped launch the Liberian Mass Action for Peace. Together with Leymah, Sugars and Asatu she helped draft the first press release calling for an immediate ceasefire and for all warring factions to sit down at the peace table. Janet then broadcast the message announcing the first meeting of the women in the field opposite Taylor’s house – hundreds of women showed up and stayed. She now lives in Dracut, MA, working towards a new goal: earning a master's degree in international diplomacy and returning to Liberia.